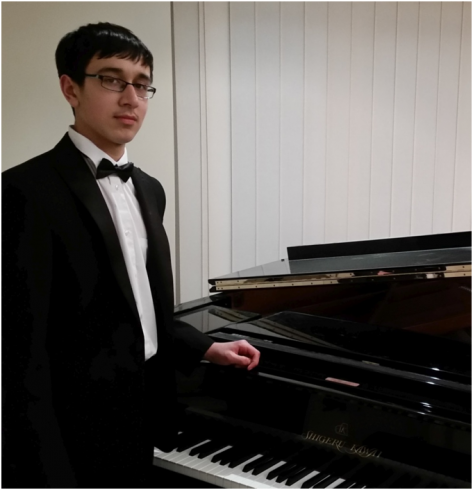 Fifteen-year-old Ashwin Tennant is a pupil at Abingdon School, where he holds both academic and a music scholarships. Ashwin gained his ABRSM piano diploma when he was 13 years old, helped by his teacher, Nigel Wilkinson. He also plays the violin, which he studies with Mariette Pringle, gaining Grade 8 with distinction, also at 13. Ashwin regularly enters local music festivals, to great acclaim. He has twice won both the Maurice Jacobson Award (for musicianship) and the Brian Hitch Memorial Award (for accompanying) at the Oxford Music Festival. He is regularly asked to play at the final concert of the Abingdon Music Festival. As a violinist, Ashwin is a member of various county youth orchestras and of the National Schools Symphony Orchestra (NSSO). He led Young NSSO in both 2015 and 2016. Ashwin made his debut as a piano concerto soloist in October 2017, playing Mozart’s Concerto No.19 with the Oxford Concerto Orchestra. He has also performed as a solo violinist with the same orchestra and, together with his siblings, has given charity concerts at the Churchill Hospital in Oxford.